Today we must pass a bit of very sad news. Ricky Gray passed away last night. Ricky had just started working at the Restigouche River lodge towards the end of 2017 season and was with us for 2018. Ricky was a great addition to the lodge team, easy going, delightful with the guests and quite a guide. The partners, staff and our guests will sure miss him, but we will not forget Ricky. I have included this photo of Ricky, his fisherman Joe Stepanittis, a regular RRL guest from The Pa. gang. Sadly Joe also passed away late last year. Well those Pa. boys had a plan already. They are in the process of framing this photo, the fly that hooked the fat salmon and some nice words. This remembrance will always hang in the RRL camp. 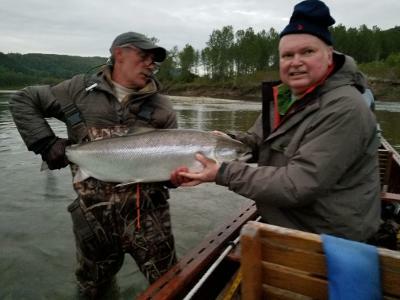 If Atlantic salmon Rivers are in heaven, you just know these two guys are on the water. With our deepest sympathy to family and friends. Four rods have just opened up in the last week of May 2019. 5/26/ – 6/2 if your interested let us know. Ice Runs on the Restigouche It took a warm afternoon on Tuesday, April 24 to finally get the ice moving on the Restigouche River. Although the ice and heavy snow pack has hung around late this season, it might just mean an easier transition to great early fishing conditions. Normally when the ice goes out the shore is solid with walls of ice bordering the river. We have had a slow melt eroding the ice from underneath and not a huge raise of water lifting and busting free the river’s ice. With the river covered in a deep blanket of snow, it has aided in a gradual controlled melt. The slow melt has moved the calendar date for the ice out and with that comes warmer temperatures. Warmer weather means little ice damming and hopefully no flooding. 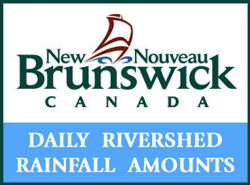 We will just have to wait and see what else Mother Nature has in store for the Restigouche River this spring. 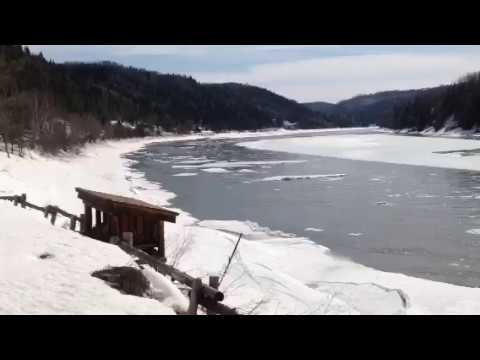 The ice run on the Restigouche annually prepares the river for the onslaught from the sea. With the river running fee, smelt begin to enter on their spring spawning run. Only a few schools at first, followed by swarms of the six inch silvery fish. Spawning conditions are great on the lower sections of the Restigouche, smelt with their bronze backs form visual clouds of these fish throughout the RRL water. 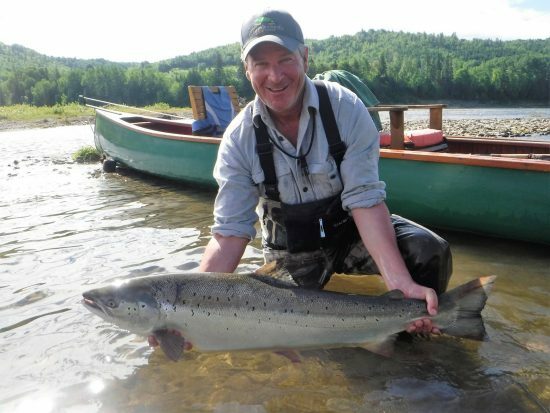 RRL partner Patrick with his first Restigouche salmon a few years ago. It’s just how nature works, as the smelt move in the Kelt’s drop down for their spring time feed. Last season’s salmon having remained in the river over winter are now looking for their first meal since entering the river last spring. The smelt run is critical for the Atlantic salmon’s survival, gorging themselves with this abundance of protein the “blacks” recondition quickly. Gaining weight and silvering up they will soon return to the ocean and a three year salty vacation. The smolt, Atlantic salmon smolt that are going to the sea for the first time join the migration, it is said that the kelt’s show the way to the feeding grounds for these first trimers. Now as these sea bound Atlantic’s clear the river it’s time for “the biggens” to appear. First come the ladies followed by the gent’s a few weeks later. 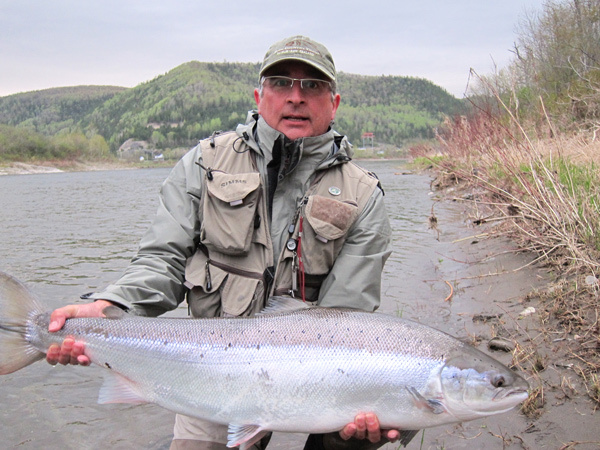 Atlantic Salmon Rivers have their own unique gene pool and the Restigouche is one of the few big fish rivers. These ladies of the Restigouche don’t mind their waist lines, developing huge girths, neglecting their diets and eating everything on their salt water table. 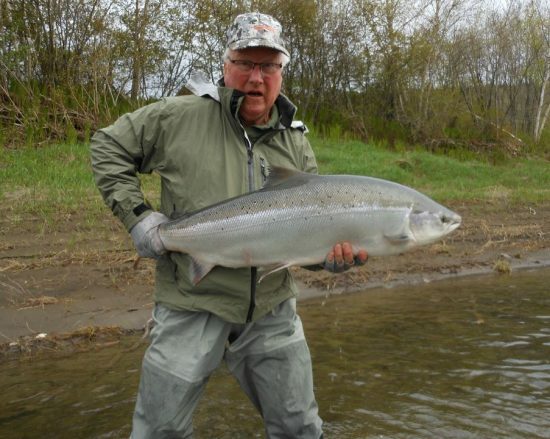 To the delight of Atlantic salmon anglers these fish of the Restigouche are big, high twenties, thirties and even in the forty pound range, enter the river each spring. 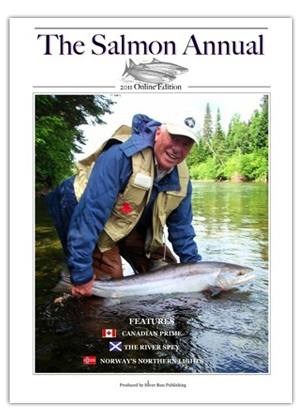 Your opportunity of landing a thirty pound Atlantic salmon is here on the Restigouche, yes even a “forty” or “fifty”! For those not making a spring trip to the Restigouche this season, make you’re date with one of these “big girls” of the Restigouche soon! 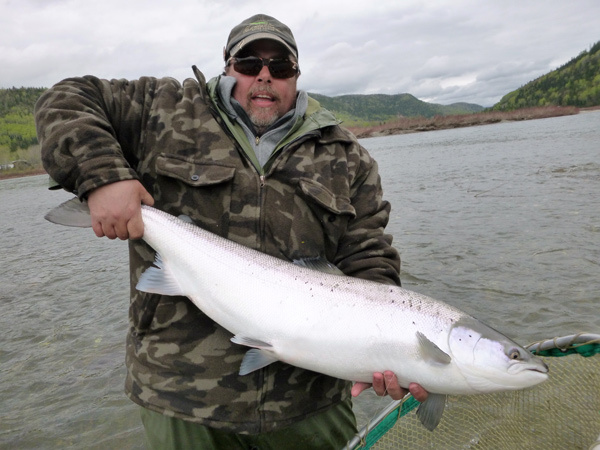 The Restigouche River Lodge has had excellent trip bookings in preparation for the start of the 2018 Atlantic salmon season. We are looking forward to the upcoming visits of our guests and wish to thank them all. We are sorry that we had to turn away so many that wanted to book one of our prime weeks. We have a new list for anyone that would like to book a 2019 prime week trip from mid-May through mid-July. As our 2018 weeks conclude spots that have not been rebooked are than available. If you would like to be the first to know join our prime week list. Email us at info@restigouchelodge.com include your phone contact. Let us know the week or weeks that you are interested in and if any other friends wish to join you. Restigouche River Lodge guests traveling by air need to be aware that as of June 30, 2018 Penair has discontinued their service between Boston and Presque Isle Maine. 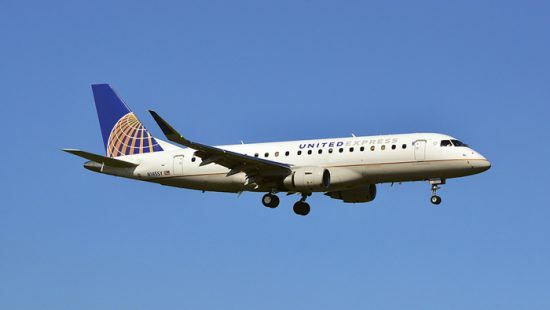 The flights to and from Presque Isle will be taken over by United Airlines. The Presque Isle RRL flyers will be going through Newark Airport in New Jersey. Please check with your carrier or travel agent for any detail’s and updates. To our flying guests have a great trip and see you at the lodge! The New Jersey Fly Fishing Show is this coming weekend. The show looks to be the best ever with a new location and a great weather forecast. See you there! For anglers wishing to book a trip with the RRL during the prime weeks there is now a new option. We are organizing a prime week availability call list. At the completion of a guest’s full week trip, they have an option to book their week for the following season. The guests not re-booking their week for the following season will than have given up their option. 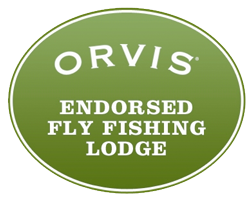 This will give other anglers the opportunity to book these most sought after weeks. If you would like to have your name registered on this list please email us at info@restigouchelodge.com. Include your phone number and any weeks that you might be interested in. If you have other anglers in your group let us know the number of fisherman. This list will be organized on a first come basis. When the emails are received, the list will be formed creating the order of notice. With the completion of our new lodge and the increase occupancy we are able to expand the RRL experience to other types of guests. Here are some of the interesting ideas that the lodge is considering. Anglers will be able to bring along a non-fishing guest during our busiest weeks depending on availability. We are planning some packages for corporate retreats and weekend getaways. The Restigouche River Lodge will be opening our dining room for certain available dates. Reservations will be taken for these special dinner seating’s. Local restaurant goers will enjoy the relaxed, supreme dining experience that our fishing guests have always enjoyed. 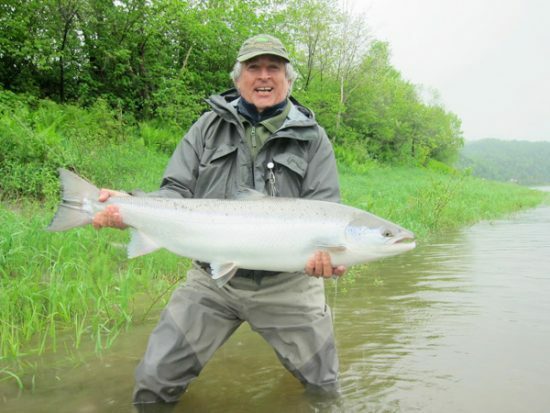 Spend a wonderful evening on the Restigouche River, full course dinners and bring your own. When available dinner with overnighters will be made available to travelers during the summer months. The Restigouche River Lodge is delighted to expand the Restigouche experience to all. At the Restigouche River Lodge we strive to exceed our guest expectations.